627-637 N. Broadway. Photo by Jeramey Jannene. 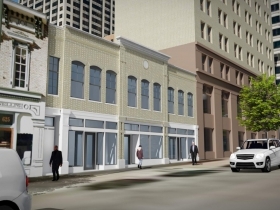 Three small buildings along the 600 block of N. Broadway are being redeveloped into six small commercial spaces under a plan by David Uihlein. 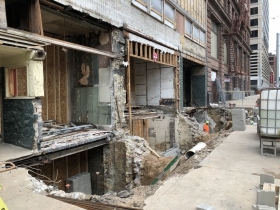 Uihlein, an heir to both the Schlitz and Bradley family fortunes and historic preservation advocate, has owned the buildings since at least 2013 through his firm District Savior LLC according to city records. 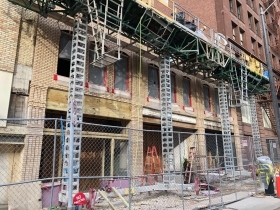 He told Urban Milwaukee in 2017 that the timing was right for redevelopment given the substantial growth of Downtown and the impending opening of The Hop streetcar line. A southbound station for the streetcar line is located immediately in front of the three buildings. The final brickwork on the complex is now visible to sidewalk architects walking to and from the nearby Historic Third Ward. The redeveloped buildings will include space for six tenants, including three storefront spaces. 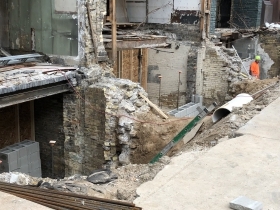 According to city records, the buildings contain a combined 9,575 square-feet of space. 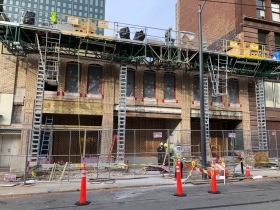 Uihlein, whose firm Uihlein/Wilson – Ramlow/Stein is doing the architectural work, has no problem monitoring progress on the site, with the firm’s offices being located around the corner at 322 E. Michigan St. in another historic structure. 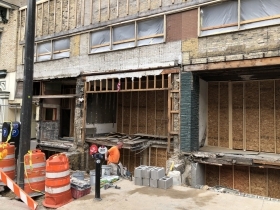 Construction work on the project at 627-637 N. Broadway is being led by Waukesha-based general contractor Stier Construction. 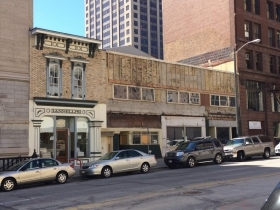 Both the three-building redevelopment project and the Uihlein/Wilson offices are located in the East Side Commercial Historic District. The locally-designated historic district mandates design guidelines for the area, something that Uihlein has shown up to support when other nearby property owners have proposed renovations or demolition. 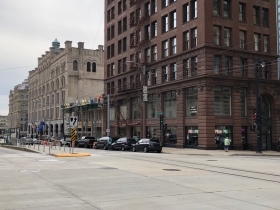 The project will be a significant step forward for a key downtown intersection. The buildings have looked pretty dilapidated for years, especially after a temporary wood covering was removed. 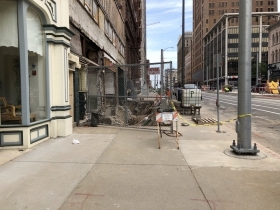 The area around them has also begun to see more life with the opening of the Hilton Garden Inn in the Loyalty Building, Downtown Books relocating to 624 N. Broadway and a Pita Pit opening in the long-vacant first floor of the Railway Exchange Building. One block south, developer Joshua Jeffers has restored the Mitchell and Mackie buildings and is planning a nine-story office building. This isn’t Uihlein’s only downtown reclamation project. The philanthropist and his wife recently made headlines for his significant (but undisclosed) gift to redevelop the Warner Grand Theatre into a music hall for the Milwaukee Symphony Orchestra.